Drinking Safely! Yep, it’s Possible! It’s July and 100⁰+ outside! 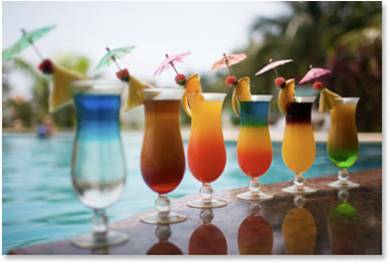 Can you picture it… floating on a raft in the pool, sipping on an icy Piña Colada topped with fresh pineapple and cherries! It sounds great, doesn’t it? Everything is great in moderation. But, it’s important to remember that the things that we drink impact our bodies as well; and I’m talking about more than just the size of our waistline. To make it easy, we have put together a list of the top 3 points to remember when enjoying some ‘fun in the sun’, especially when alcoholic beverages are involved. 1. Temperature: The outside temperature plays a big role in how our bodies react to the alcohol that we consume. The amount that you may be able to ‘normally’ consume inside at a comfortable temperature may be drastically different than the amount you should consume in excessive heat. 2. Impaired Judgment: Relaxing by the pool tends to make us all a little less cautious than we usually would be. So, when we start drinking alcoholic beverages, it is not uncommon for our judgment to become impaired. There are many dangers at the pool including hard surfaces, as well as the risk of drowning in the water. These risks are very real and we need to have a healthy respect for them. 3. Get Plenty of Water: Both alcohol and caffeine are diuretics, causing them to contribute to dehydration. Combined with excessive heat, you could find yourself in a lot of trouble very quickly. So, it is very important to drink at least 8 oz. of water every hour to stay hydrated. Summer is a great time to have lots of fun. But, it’s still important to remember to be responsible when enjoying poolside time with family and friends. As always, if you have more specific questions regarding health and nutrition education, visit our website at www.ncescatalog.com, call us at 800.NCES.BOOKS or chat live with our dietitian here.